In Australia, farmers are the lifeblood of our country and they are in crisis. Record breaking heat and lack of rain means farmers are struggling to feed sheep and cattle, and keep crops alive. Families on the land are suffering and they need our help. 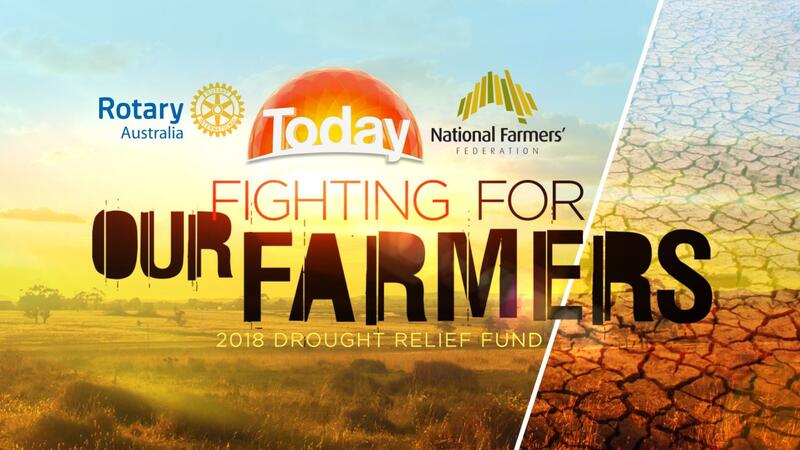 Channel 9 and Rotary Australia have partnered with the National Farmers’ Federation, launching an appeal to big business and everyday Australians, so we can provide some emergency relief. 100% of donations go to the farmers and are tax deductible via Rotary and RAWCS. Every dollar counts. District 9685 calls on all clubs and Rotarians to get behind the urgently needed district support program for stricken farming communities. Donations to the Australia wide RAWCS Account as seen on The Today Show on Channel Nine on Thursday 2/8/18. RAWCS Account 17-2018-19. Clubs encouraged to make donations (generous giving please) viaDistrict 9650 RAWCS account which offers tax deduction and will be matched $ for $ up to $15,000.00. District 9650 is very, very drought affected. Donate via RURAL AID, which operates the Buy a Bale Program. 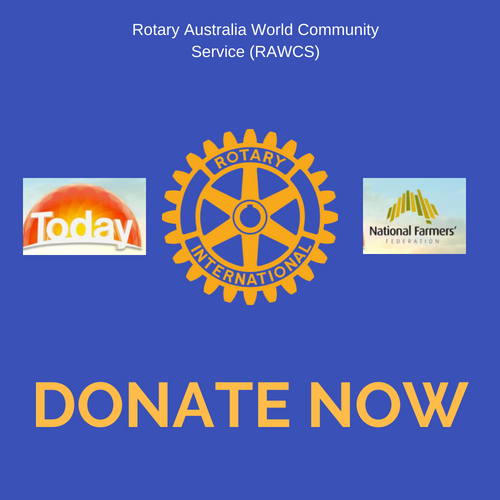 Clubs can also donate to Sydney Rotary clubs Hay Appeal. The club sends convoys of semi-trailers with feed to the bush. The cost of a semitrailer is approximately $14,000. Clubs that have relationships with country communities are encouraged to continue to support via the short-term goals. The long-term plan is to provide moral and physical support to these communities. Possible club visits to hard hit rural areas to implement working “bees” for support around the farm and home. It is important to remember that it is not only the Farmers doing it tough but the small businesses and schools as well. District 9685 has appointed Rotarian Barry Edmundson as our Coordinator. Barry is the “go to” person for information on where and when support is to be provided. Clubs are STRONGLY encouraged to advise Barry of their plans and actions. We are working with other districts around the country as we strive to cover all critical situations as soon as possible. Any and all support will be gratefully received at this time. Other agencies providing support are CWA, Salvation Army Bush Schools education and the major Church organisations. Goods either new or second hand are not a good idea, as we need to provide cash to support the small business in stricken area. Our Central Coast Rotary Clubs have been meeting to form a coordinated approach with the 5 clubs in the cluster. Barry Edmundson’s email is jbedmundson@gmail.com. Let’s all commit to this vital program immediately!